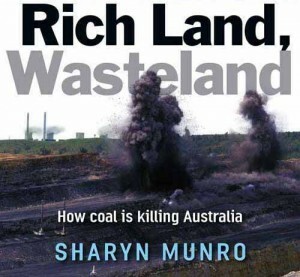 Rich Land, Wasteland: How coal is killing Australia. A review essay by Len Puglisi. If you’ve ever had doubts about what (1) the economic rationalist / neoliberal ethos, or (2) corporate-consumerist capitalism might mean for an Australia inside a mining boom as the dominant driver, look no further than this book by Sharyn Munro. Munro has undertaken a wide-ranging spread of on-the-ground interviews with people in many of the agricultural regions of Australia, has attended untold meetings, and has culled myriad reports and tribunal/court hearings. In doing so, she has documented a sad tale: displacement of people, loss of community, flora, and fauna, severe health effects on many people, loss or degradation of prime land and water courses, and industry intransigence, obfuscation and, it would seem, shameless deceit.